(by John White, The Wall Street Journal, WSJ.com) – Three years ago I began an effort to have the Medal of Honor awarded to George Washington. This, the highest military decoration an American soldier can receive, is conferred for “gallantry and intrepidity at the risk of life, above and beyond the call of duty” in combat with an enemy of the United States. Although the medal was created in 1862, others have received it posthumously—and if ever there were a soldier deserving of this award, it is George Washington. Most Americans know Washington as the “Father of Our Country.” What many don’t know very well is that he was fearless in combat. Time after time he put himself in [danger] to command and rally his troops. He led from the front, and his actions in combat compare favorably with the bravest of the brave in our nation’s history. Washington was never wounded in battle, which caused many of his contemporaries, friend and foe alike, to think he had the protection of divine providence. In fact, Washington himself said as much—not in a boastful way, but with humility and gratitude for being kept safe from harm as he performed his military duty without regard to danger. At 6 feet 3 inches in height and with his distinctive general’s uniform, he was easily recognizable and often a target, especially for sharpshooters. But he was unfazed. The stories of Washington’s courage under fire are legion and span a military career that even predates the War for Independence. • At the Battle of Fort Wilderness in 1755, during the French and Indian War, for example, Washington served in the Virginia militia as aide to British Gen. Edward Braddock. Near the fort, Braddock’s 1,300-man unit was trapped in a deadly ambush by the French and their Indian allies. Eight hundred British and colonial soldiers were massacred. Washington rode all over the battlefield, carrying Braddock’s orders to other officers. Detail of George Washington in "The Death of General Mercer at the Battle of Princeton, January 3, 1777" painted by John Trumbull. When the two-hour engagement finally ended, Washington had four musket-ball holes in his greatcoat and had had two horses shot from under him. Various survivors later reported that the hail of gunfire at him was so heavy that they expected him to be killed at any moment. He would exhibit that valor again in the War for Independence. • At the Battle of Princeton in January 1777, American militiamen began to flee after the British overran Continental Army troops. On seeing that, Washington rode up with reinforcements and rallied the fleeing militia. Then he personally led the counterattack on the British. Washington was only 30 yards from the British lines when he ordered his men to fire. When both sides fired, Washington disappeared in the smoke. 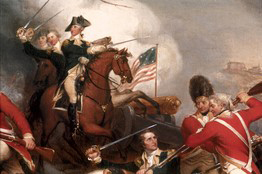 When the smoke cleared, Washington was unharmed but the British regulars had broken. Washington then ordered a charge and headed directly toward the British troops, yelling at his own soldiers to rally behind him. The British retreated and fled. Washington’s willingness to lead his troops from the front, while shots from British sharpshooters and his own men flew across the battlefield around him, inspired the American forces to hold together throughout the war. A young officer who observed Washington in combat at the Battle of Princeton wrote, “I saw him brave all the dangers of the field . . . with a thousand deaths flying around him.” The sight of his commander in chief, he said, set an example of courage such as he had never seen. • At the Battle of Monmouth in June 1778, the American soldiers began retreating in disarray. Washington, who was nearby observing the battlefield, rode among them, up and down the British lines, to halt and reverse the rout. Sometimes he was only 30 to 40 feet from the enemy. His only protection was the smoke of battle. Awarding the Medal of Honor to Washington would accomplish three objectives. First, it would properly recognize his bravery in battle. Second, it would bring public attention to that fact, which in turn would encourage greater public awareness of American military history in the Revolutionary era. Third, it would elevate Washington as a role model for young people, showing them the courage that defines a true hero, as distinguished from entertainers and other celebrities. Since the Medal of Honor is awarded by the president in the name of Congress, Congress must act. So far military and patriotic groups—such as the Veterans of Foreign Wars, Sons of the American Revolution and National Sojourners—have expressed their support. All these groups recently passed resolutions at their national conventions endorsing the effort to award the medal to Washington. In 1976 Congress gave George Washington the five-star rank of General of the Armies of the United States. That made him the highest ranking military officer in American history. A Medal of Honor would be a fitting action to recognize him not simply as the commander of the Continental Army, the president of the Constitutional Convention and the first president of the United States—but also as one of the nation’s most heroic combat soldiers. Mr. White, an author and former naval officer, is writing a book about the Declaration of Independence as a spiritual document. Published January 27, 2012 at The Wall Street Journal. Reprinted here February 16, 2012 for educational purposes only. Visit the website at wsj.com. 1. What did George Washington believe was the reason he was never wounded in battle? 2. List at least 5 words used to describe George Washington’s actions (or his personality) in this commentary. Do you think that in reading about his bravery and leadership in battle, teens will recognize George Washington as the true hero? Explain your answer.